Focal calcium deposits within tip of renal papillae; can project through papilla wall and act as nidus for precipitation of urinary salts. © 2019 InsideSurgery.com® · All rights reserved. 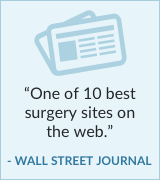 This material may not be published, broadcast, rewritten, or redistributed without the express written consent of InsideSurgery.com.